The post is really hard for me. I knew it would be. But I didn’t think it would be this hard. Bare with me while I struggle through. So, back to the SPCA we went. I knew I wanted a grey cat this time. 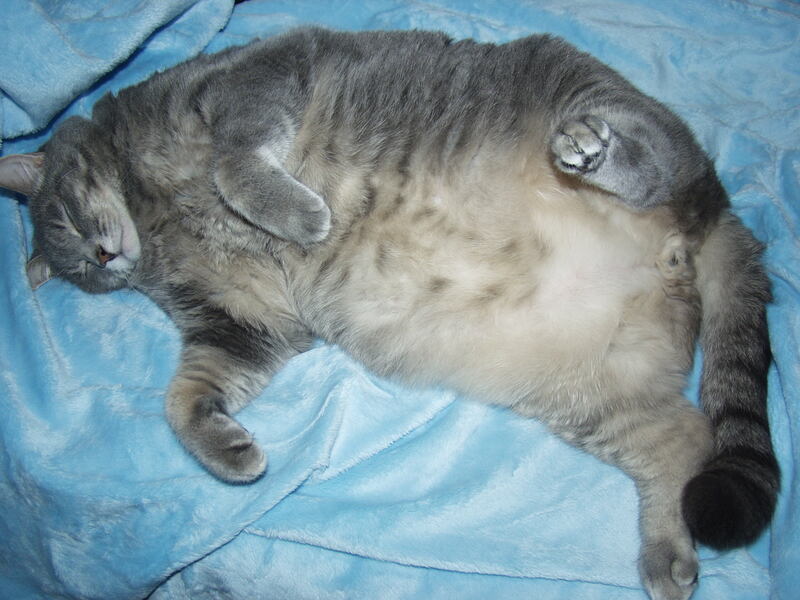 But my idea of a grey cat was like a Russian Blue. But when we went there, this little grey tabby who was very friendly, just wanted some love. I asked the attendants if I could hold him and he just snuggled up with me and gave me all the love he could. I immediately fell for him. The only problem was, there were 4 names already on his card. He wasn’t allowed to be released until 4pm the next day. They asked if I wanted to put my name on the card. I said, sure, why not. But I knew I would never get him. But we tried anyway. They told me their policy was if the first name didn’t show up by 4:10, they would go to the next name. Ten minutes between names. Maybe there was hope. We showed up a little earlier than 4pm the next day. And waited. Four-ten came and went. The first name was crossed from the list. Four-twenty, and the second name was crossed from the list. By four-thirty, my heart flipped and my stomach roiled as they crossed the third name from the list. We brought him home but had no name for this scrawny grey cat. His head was just too big for his body. We thought of calling him Dusty. Only because he looked like those little dust bunnies you get under your bed. But that just wasn’t right. It only took a couple of hours from the time we brought him home, til the time he told us his name. It was about lunch time and The Hubs made a peanut butter and jelly sandwich. That grey cat just looked at him crooked and begged. So, The Hubs offered it to him. The grey cat not only sniffed and nibbled it; but, once he caught a whiff of that peanut butter, he snatched the entire sandwich out of The Hubs’ hand and RAN! About an hour later, we had chocolate cake and that cat did the same thing. So we set up an experiment to see what he DID NOT eat. Wasn’t much! He ate it all! Well, everything he could smell at least. He wouldn’t eat plain yogurt, or sour cream. He liked peanut butter the best, then chocolate. (No, we did not feed him chocolate on purpose! He just found some. And when he could, he’d lick what he could off our fingers, our plates, our mouths.) Pickles! OMG he ate pickles! One morning, we caught him digging in the trash after some coffee grounds. The Hubs was trying to unstick our pencil sharpener and left a paper towel full of oil and pencil shavings on the floor while he went to go get something. He came back and there he was, nomming on the pencil shavings. Poor kitty. He must have been starving out there in the wild! I love that belly. I used to bury my face in it. How could you not resist?? MikeyKat was my buddy. He talked to me. He greeted me when I came home from work. He loved being in my lap, no matter where I was. 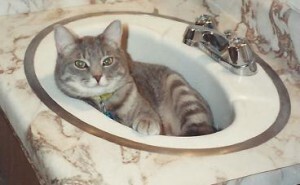 Just like GoofyKat, Mikey was a well-traveled cat. He was born in VA. And while he didn’t make it to Michigan, he did go to Germany, Texas, and Florida with us. 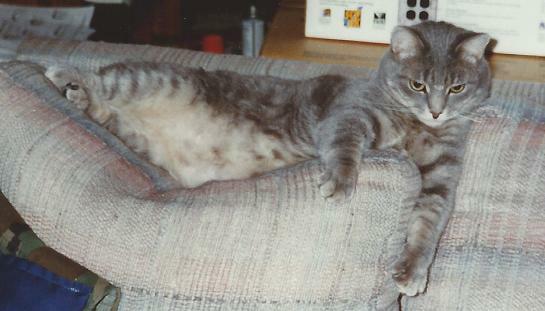 It was about a year after GoofyKat passed over the Rainbow Bridge things went down hill. We knew for a very long time MikeyKat was overweight. But we tried everything to get him to lose the weight. He just couldn’t. He looked like he might be suffering arthritis and I had to set The Boy’s step stool at the side of the bed for him so he could come sleep with me. And then, it just got worse. Within 3 weeks, MikeyKat went from 17 lbs to 11lbs. He wasn’t eating, he couldn’t walk. He was sleeping too much, hiding and such. At first we contributed it to his hearing loss. But, when he stopped eating….and Mikey never turned down food….that’s when we knew something was horribly wrong. When I took him to the vet, his temp was 96 and they did the blood work. His test came back: renal failure. The vet said with his temperature the way it was and how he was acting, he didn’t have much longer. 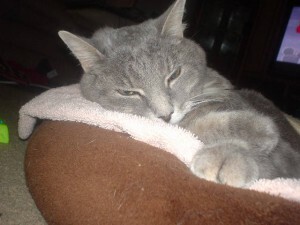 I brought him home and spent one last night with him….my MikeyKat….and now, I don’t have him anymore. He loved everyone, unconditionally. I’ve always said MikeyKat was a Black Lab in a previous life. He was the closest thing I want to a dog. His loyalty. His love. I miss him so much. And, as I said, this was a very hard post to write. I’m so sorry about Mikey! (I totally remember those commercials). 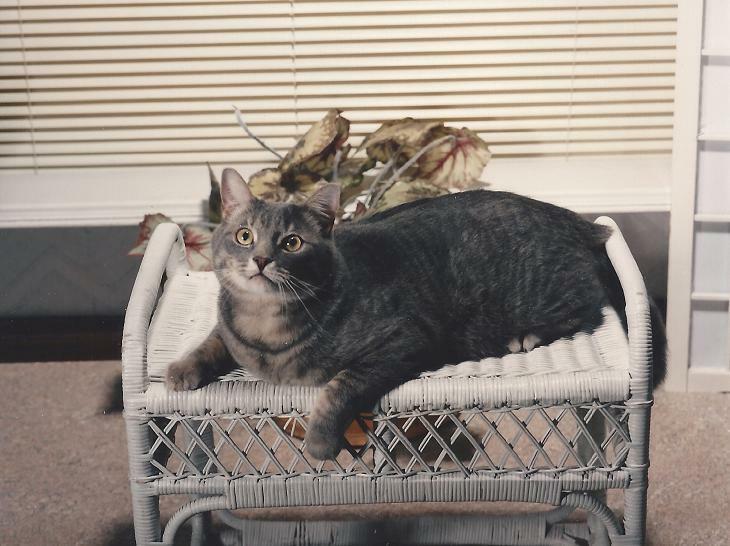 My family had a cat named Genny (short for Genesis) who would eat anything as well. 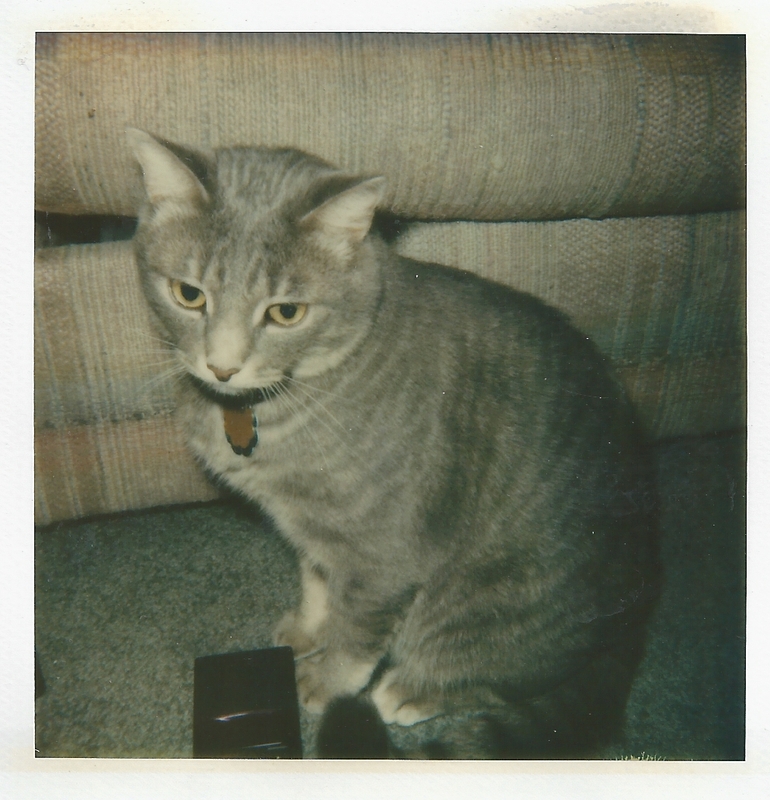 She loved mince meat and if you took a pound of hamburger out of the freezer to thaw, she knew and would come running. She loved ice cream. 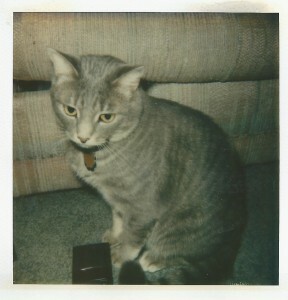 And was such a loyal kitty as well. I’m really sorry (((HUGS))). 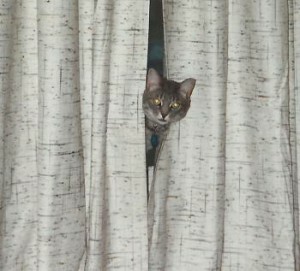 Cats are the most amazing animals, and such good buddies to have in our lives. MikeyKat sounds a lot like NIkki. She tried to drink Theraflu once, loved OJ, and hot sauce. She has renal failure too. Luckily, she’s still eating. We caught it early. Sorry to hear about your buddy. 🙁 He sounds like he was an awesome Kitty. So sorry. 🙁 I’m glad you got to have the time you did with him. He sounds delightful. awww *hugs* What a fluffybelly!! He was gorgeous! I have a weakness for tabbies, and the black and white random spotted ones (I call them cow cats, but I know that’s not what they’re actually called). 54 mySQL queries in 4.217 seconds.